Border security between the US and Canada has been in the news a lot lately, with the concept of a North American “perimeter” coming to the fore. The following is a Q&A on the subject with Pace Law Firm immigration attorney Andy Semotiuk. If you need further information, or are interested in obtaining a Canadian or US visa, contact Andy here. Andy, what do you think of the current discussions going on between the US and Canadian governments on border security? Any traveler to Europe has to be impressed with the way the European Union has managed to facilitate inter-state travel through a similar deal to what is being contemplated here in North America. Anyone who has obtained temporary resident visas for Canada or B-1/B-2 visitor visas for the United States knows that the criteria for issuing such visas are almost identical. It makes little sense for our two countries to be duplicating each other’s security clearances for foreigners coming into North America. On the contrary, as far as security is concerned, getting it right once and for all on any entry into North America, whether into Canada or the United States, will likely improve our security in both countries. Are there any special areas that need to be covered in these discussions? For one thing, the Americans need to accept Canadians with Maple Leaf cards and permanent residence on the same basis as we accept Americans with green cards. This means that those Canadian permanent residents who come from countries outside the European Union and the Commonwealth should be accepted by the U.S. without the need for Consular visas. A permanent resident has already been vetted by Canada and presents no more danger than a similar permanent resident in the United States does to Canada. You do a lot of work on cross border marriages and immigration. Are there any issues there? A Canadian marrying an American should not have to go through the third degree at the border in regard to entering the United States, nor should an American spouse have trouble entering Canada. If someone is interested in sponsoring a spouse to immigrate to either country, they can drop me a line at our office. What about criminal matters? How do we protect ourselves in that regard? Well, as I mentioned, I favour a security perimeter around North America – the U.S. and Canada but not Mexico – where we process outsiders coming into North America like they process them in the European Union. Once you enter one country in Europe, entry into others is pretty straight forward. 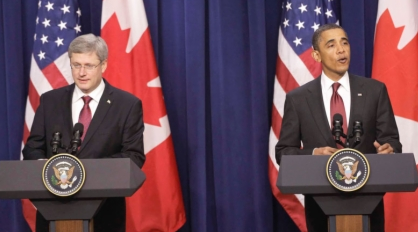 As for criminal matters inside North America, I believe there is a need for the USA to recognize Canadian pardons. That is a matter that could be raised in the discussions. What is the core message you are trying to get across? In short, we need to strengthen our grip on North American security but loosen up on the flow of goods and people along our Canada-US border.